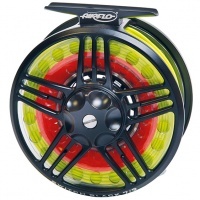 New for 2014, the Airflo Switch Black reel offers incredible value for money. Built to the same design as the Airflo Switch Pro, this die cast reel offers the same stunning features at a truly unbelievable price. The Airflo Switch is available in two reel sizes and each reel comes with 4 additional clear spare spools and a custom fit reel bag.